New research from Yale University reveals that the protein Nlrp9b recognizes rotavirus and forms a complex inflammatory response to kill viral cells and prevent further infection. Rotavirus is the most common cause of diarrhea in infants and young children worldwide. It is highly infectious and potentially deadly. The virus, which has evolved strategies to evade the immune system, is the focus of new research lead by immunologist Richard Flavell and published in Nature. The research team focused in on a protein, Nlrp9b, that senses invaders in the gut. To understand its mechanism and role in protecting the body against rotavirus, the researchers observed the protein in genetically modified mice and in vitro culture. Through a series of experiments, they tested the protein’s response to viral RNA and observed the pathways it triggered. The researchers found that Nlrp9b recognizes rotavirus and forms a complex inflammatory response to kill viral cells and prevent further infection. “It’s the first time that we report the function of Nlrp9b to act as a safeguard to protect against intestinal virus infection,” said first author Shu Zhu. Read the full paper in Nature. Abstract: Rotavirus, a leading cause of severe gastroenteritis and diarrhoea in young children, accounts for around 215,000 deaths annually worldwide1. Rotavirus specifically infects the intestinal epithelial cells in the host small intestine and has evolved strategies to antagonize interferon and NF-κB signalling2, 3, 4, 5, raising the question as to whether other host factors participate in antiviral responses in intestinal mucosa. The mechanism by which enteric viruses are sensed and restricted in vivo, especially by NOD-like receptor (NLR) inflammasomes, is largely unknown. Here we uncover and mechanistically characterize the NLR Nlrp9b that is specifically expressed in intestinal epithelial cells and restricts rotavirus infection. Our data show that, via RNA helicase Dhx9, Nlrp9b recognizes short double-stranded RNA stretches and forms inflammasome complexes with the adaptor proteins Asc and caspase-1 to promote the maturation of interleukin (Il)-18 and gasdermin D (Gsdmd)-induced pyroptosis. Conditional depletion of Nlrp9b or other inflammasome components in the intestine in vivo resulted in enhanced susceptibility of mice to rotavirus replication. 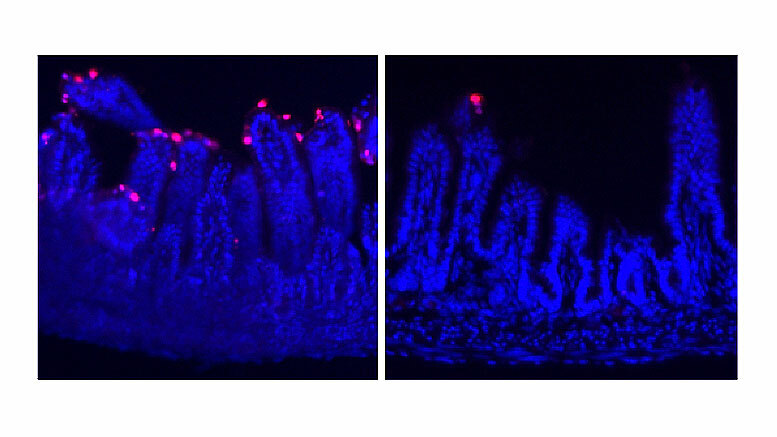 Our study highlights an important innate immune signalling pathway that functions in intestinal epithelial cells and may present useful targets in the modulation of host defences against viral pathogens. Be the first to comment on "New Yale Study Shows Protein Nlrp9b Recognizes Rotavirus and kills Viral Cells"